Hi, Daniel here. 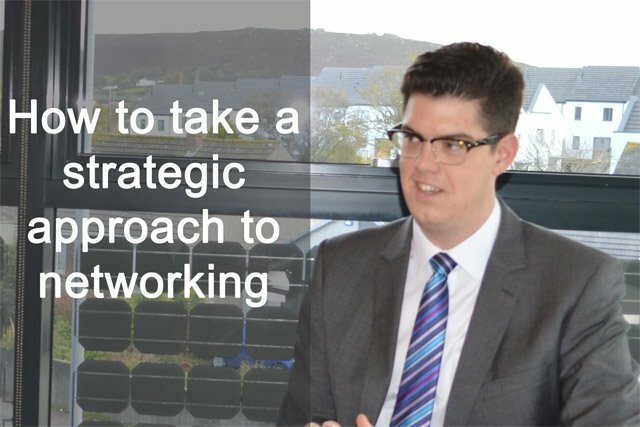 I’ve spent some time looking at how senior executives can network effectively, with our Networking Skills Coach, John Harvey. In order to get the most out of your networking, it’s vital to do your research and invest time in yourself. Determine which area you want to work in, defining parameters by sector and location. Dare to dream -what companies would you like to work for or with? When you’ve identified your prospects, the next step is to get onto their radar so that they become aware of you and you can begin to establish a relationship with them, particularly, the key decision makers within the organisation. Find out where they network and seek to attend those events. Search your LinkedIn contacts for people who are connected to the company or individuals in question and ask for an introduction. Follow them on Twitter and when they follow back start a conversation. Cultivate a strong online presence and make sure you’re visible to potential employers by publishing quality content on a regular basis and being active in relevant online groups. At events where your prospects are present be bold and seek them out. Afterwards, follow up and think about taking the relationship forward. It takes time to build a relationship with a company or individual to the point where they hire or do some business with you, on average around 18 months from the first contact. It’s important to build relationships with as many people as possible within your target organisations. You want the power of ‘word of mouth’ working for you. Never forget the power of a ‘thank you’. Many people do, so acknowledgement with a simple thanks reinforces your mastery of networking to your new employer or contact. And finally, as we all know, networking is an important part of any business growth strategy. It’s time to make networking a priority. Need Personalized Job Search Advice? Book your complimentary, confidential career strategy call with our Managing Director, Steve Nicholls, via Skype or telephone to discuss your current situation and any challenges you’re facing in your job search. This programme is delivered over three to six months, depending on your availability, and how fast you want to complete. We’re looking forward to helping you create an inspiring and motivating next stage in your working life, by using this thought provoking process. Contact us to arrange an informal confidential chat. Copyright © 2018 Executive Connexions Ltd. All Rights Reserved.